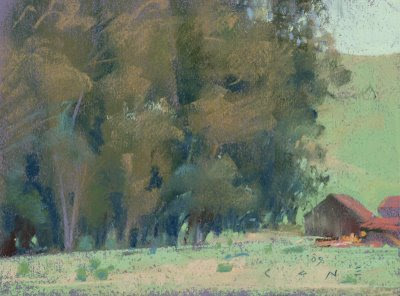 The California Art Club hosted a gathering of artists at Pt. Reyes last weekend. A large group stayed at the hostel near Limantour Beach. 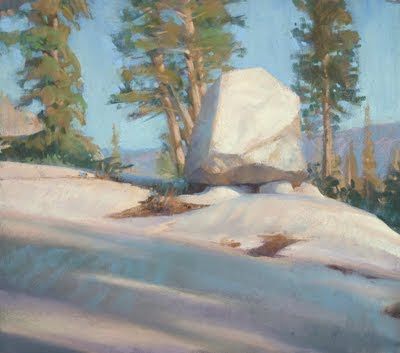 The weather was warm and clear, with some great semi-foggy morning light to work in. 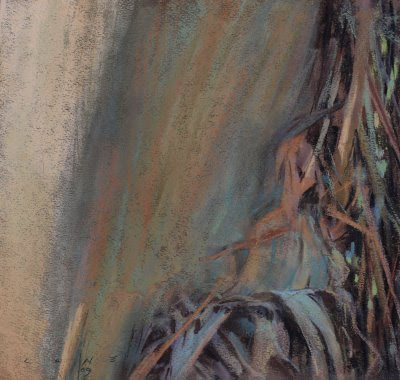 All images are pastel on Canson paper. More notes to come. 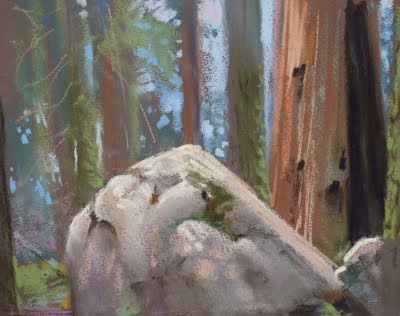 Late last month, I was fortunate enough to be part of a group of artists, writers, naturalists, former park rangers, and educators who were invited to spend a few days camping near the Giant Forest in Sequoia National Park as guests of the Sequoia National Park Foundation. 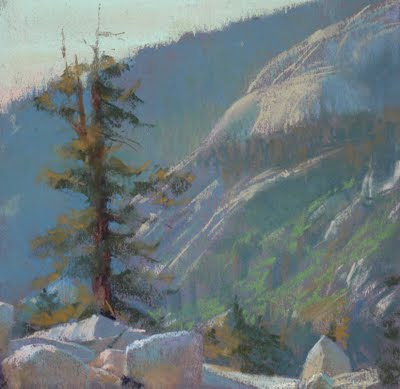 A group of us would head out and paint every day, meeting up periodically with the others, some who had extensive experience in the Park. 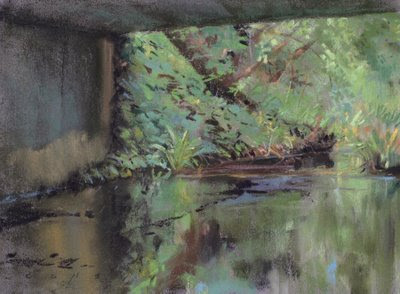 We were taken to some wonderful spots to paint, fed well, and had stimulating discussions (fueled with poetry and wine) at all hours of the day. It was quite a wonderful experience to be a part of, and I hope I can do it again. The mix of individuals and viewpoints made for lively interaction. This is the kind of retreat, with no fixed agenda, that stimulates creative potential of all sorts. It was a very positive and thoughtful experience for me. 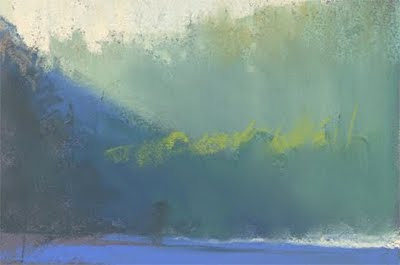 This year also marks the 5th year of an annual painting packtrip that I have put together with the help of my artist friend, Paul Kratter. Paul, and another packtrip stalwart, photographer Bob Watters, were also invited to the above mentioned event, so we planned our back country adventure to dovetail with the one in the front country. For this part of the trip, we invited 4 other artists, Suzanne D'Arcy, Carol Tarzier, Sharon Calahan, and Ann McMillan, to come along. 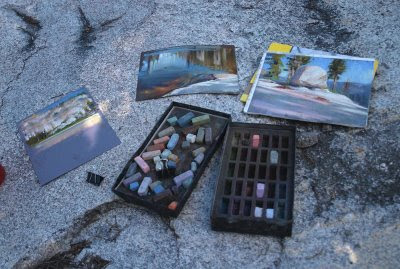 We hired a cook and mules from the Horse Corral Pack Station, run by Charlie and Judy Mills, to haul a field kitchen and most of our gear, up to Pear Lake out of the Wolverton trailhead for 5 days of painting in glacially carved granite at 9500'. It was quite a nice spot to work, and the company was good. I've posted below a range of studies from both trips in a general chronological order with a few notes appended. We were camped at a boy scout camp about a quarter mile below the trailhead into the back country. 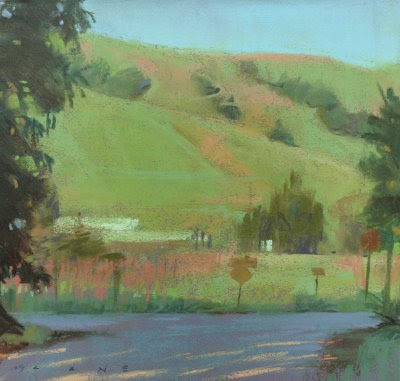 This was painted in the parking lot of an old ski area that has been closed and overgrown. It was a nice spot to walk to in the morning and get in a study or two before walking back for breakfast. 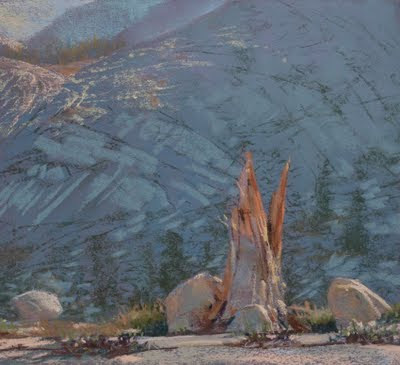 I looked at a lot of Sequoias, but this is the only one I painted. They had a marvelous bark color, bordering on orange in direct sunlight. The light on this day eventually became completely overcast, and I became more interested in the 'tree holes' of sky poking through. 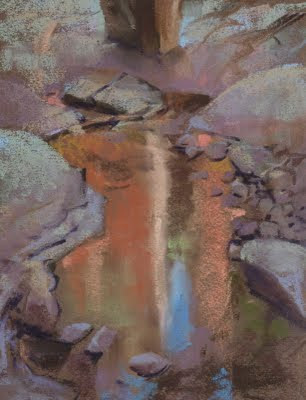 Painted in a rather deep, granite lined creek bottom, looking at a reflection of trees up the slope that were well illuminated by morning light. After breakfast that same day, we hiked up this granite lined drainage full of small pools, boulders and streams of shallow water pouring down, one after the other. This boulder at the bottom of one of the descending ramps of granite caught my eye. 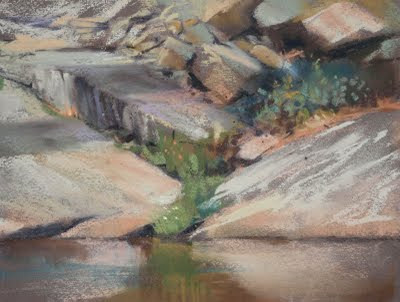 I stayed there most of the day and kept doing studies. This is fairly late afternoon. While the color is not so interesting, the collision of forms, made an interesting composition to my eye. 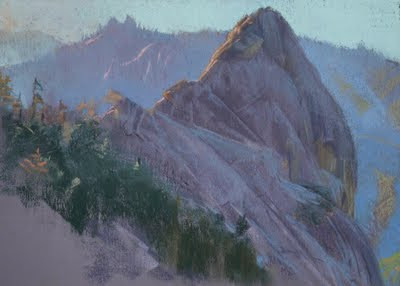 This is painted looking South towards Morro Rock in early morning light, one of the icons of the park. 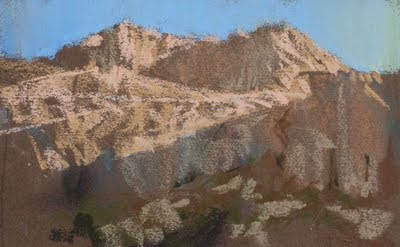 One of the studies of Alta Peak I did the first afternoon at Pear Lake. 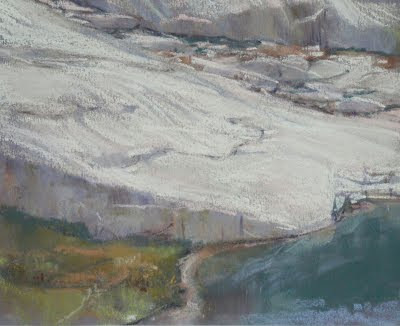 The whole basin was almost entirely formed of solid, streaked and fractured, glacially polished granite, along with erratics and many boulders that had tumbled down the steep walls surrounding the lake. Alta Peak sat at the far end of the lake from where we were camped. 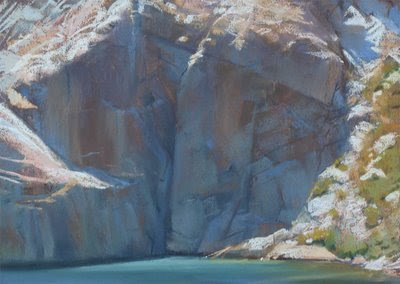 You could pick out a section of the steep walls surrounding the lake, and find interesting compositions. This area had some 'survivors'... trees that have toughed it out in a harsh place. We had one day with a white sky that just flattened all the light. I hiked around and became intrigued by the patterns of solid rock running down to the lake. Even in flat light they were interesting.... to me anyway! Perhaps I was desperate. I did several studies of this type. They may yet bear fruit. A midday painting. Below the lake, there was a lengthy sloping drainage covered with fractured slabs of granite, some vegetation, trees, and periodic boulders. Late afternoon, looking northwest down the drainage to the opposite slope of the valley. 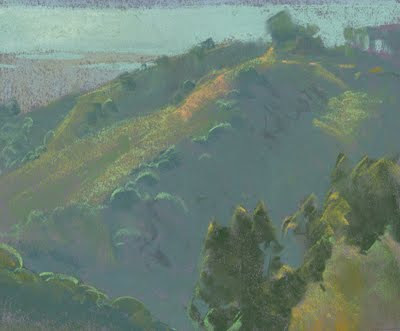 This view stayed fairly stable for a long period of time in the morning, as the light would slowly creep over the far rim of the drainage on the east side, while the foreground was bathed in warm light. The main surface of the drainage was patterned with cracks and fissures. I painted a few of these views. 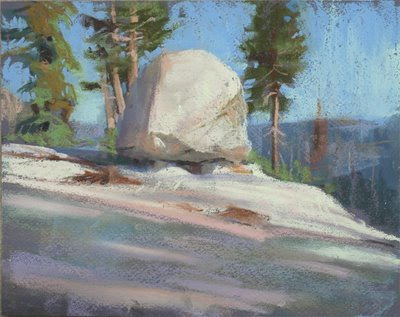 Here is a studio piece from a study I did on a backpack trip a few weekends ago in Yosemite. 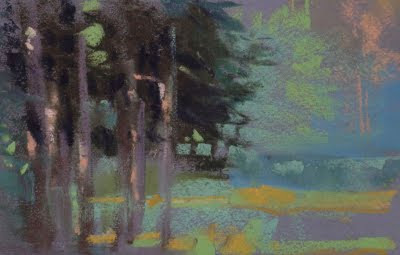 Still trying to find the balance between gesture, immediacy, the way the material behaves, and the drive towards more resolution of the image, exploring more subtle issues, (edges, the final frontier) which the studio environment provides. When to stop? I even made some changes to the image since I shot this version, though they might not be noticeable to most. I have a few shows coming up and am headed overseas for a week, so needed to get all my work finished and framed. 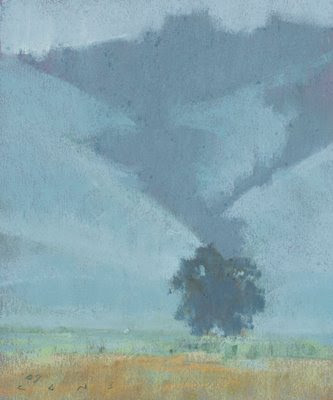 This one is destined for the Studio Gallery's upcoming landscape show, 'Terrain', opening in San Francisco on the 12th of August. 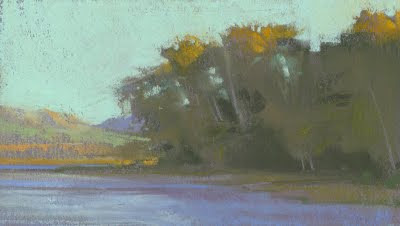 The study for this as well as one of the lake that I previously posted will also be in that show. Maybe one more piece... not sure yet. 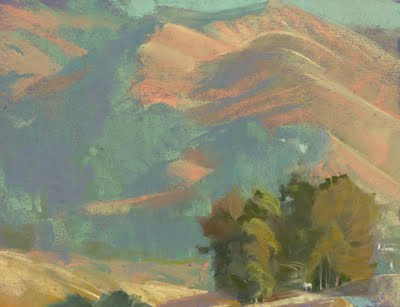 I am also going to be in the Napa Valley Art Festival in a few weeks, which takes place on Saturday, August 15th. 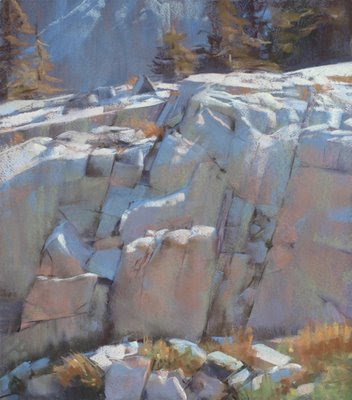 I'll have about 8 paintings for sale in that event, including Granite in Shadow, which I'm honored to announce was given the Jurors' Choice award. Should be a fun day, and I hope to see some familiar faces there. I did my first 'real' backpacking trip this weekend with some coworkers and had a great time. We hiked over 6 miles out of Tuolomne Meadows, climbing over a 9,500 pass to get to a basin filled with small lakes near the south rim of the Grand Canyon of the Tuolomne. 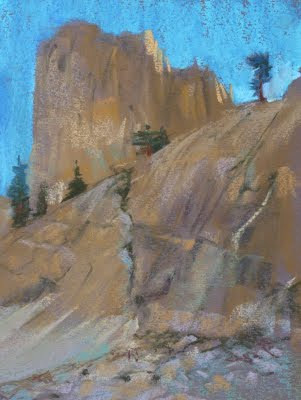 Not so much time to paint on a trip like this but I did get one afternoon and morning in. I had made a very portable pastel setup, which is visible in the photo, by cutting a lot of sticks in half in order to have the colors I needed. I stored my paper (and my finished pieces) in a cut down pad of tracing paper with about half the paper in the pad removed. I clip the Canson paper to a piece of foam core cut to the same size as the pad. Very similar to my large setup but it weighs a lot less. Worked fine. 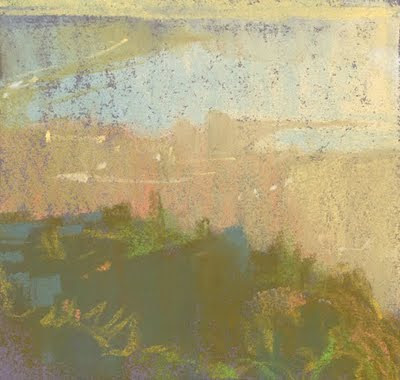 These are pretty quick and loose studies, about 7 x 9", which I may use to do some larger studio pieces. 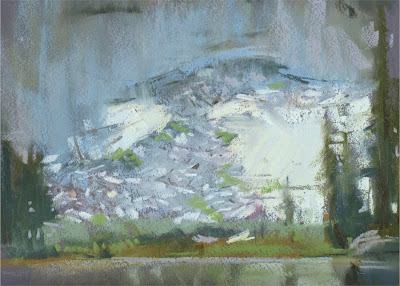 One interesting aspect of a 'study' is that you don't try and render, but more or less notate and hammer down values, shapes, and colors that collectively represent something. More or less what painting is all about anyways, but rather brutal... less finesse. Studio work gives one time to noodle and contemplate a bit. Not always the best thing either! 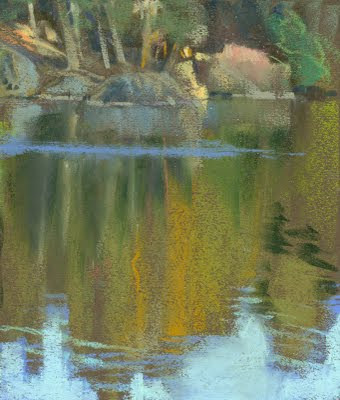 I've been busy for the last 6 weeks teaching some pastel classes at work, so have not been very productive. 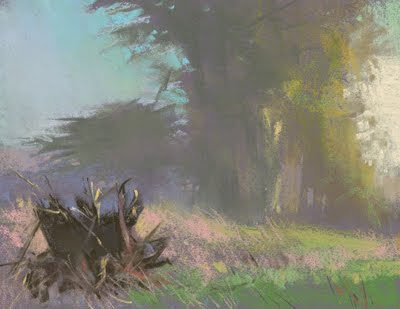 I do sometimes setup to paint when I'm out with the class, but most often move around offering advice, and "meddling' on their work. Its really quite fun and rewarding, but I have only some fairly rough studies to show for it. 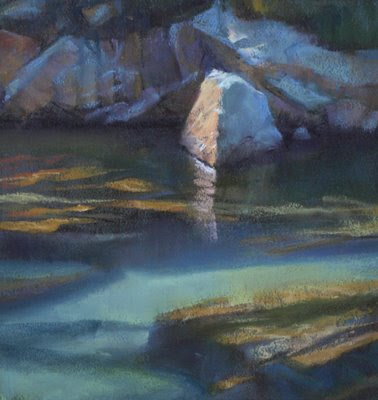 This is a studio piece, based on studies and reference from last summer's trip to Lake Ediza. Granite is so light in value that it is like a litmus paper for ambient and reflected colors when it is in shadow. 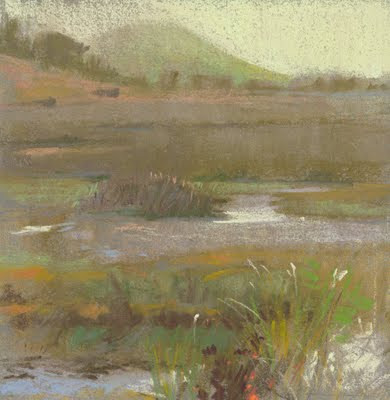 I spent last week painting for the Sonoma Plein Air event, a non profit organization that raises money to fund art education in the public schools in Sonoma County. I have been a part of this event every year since its inception. I arrived late on Monday, so just scouted locations in the afternoon drizzle that might offer shelter and a view of some sort. Tuesday and Wednesday were both wet, though it cleared on Wednesday afternoon. 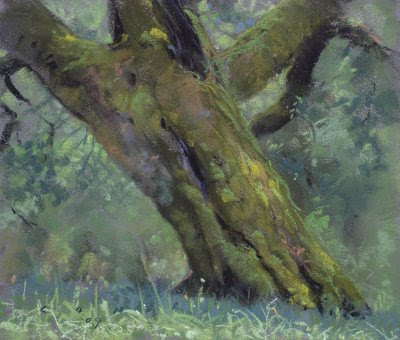 By then I was keyed into the possibilities of tree moss in gloom, and had to recalibrate my sensibilities to the 'glare' of direct sunlight casting shadows. Shocking. 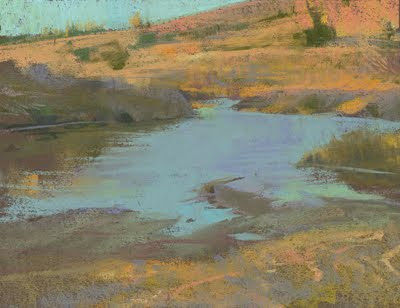 Here are the paintings, all pastel on Canson paper. I did 14 pieces, didn't bother to frame 2 of them (woof!). Sold 1 at the auction dinner, then 4 on the day of the show. I was beat by the end of the week, but had a great time. 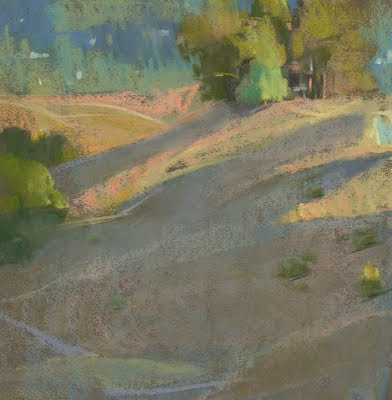 Sonoma Plein Air is well thought out, and superbly run by great people. 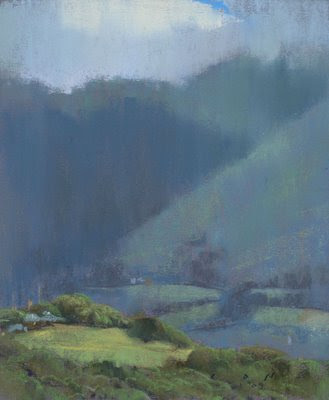 Painted in an off an on drizzle from the back seat of my car with the window rolled down. This is later that day with weather moving in. I was outside the car under the back hatch, with an umbrella up for further protection. However the cars roaring by a few feet away periodically swirled a mist onto my paper, some of which is stlll visible. Finally the entire background disappeared behind a grey wall. Time to go taste wine. While I was painting this, some vineyard workers came by and told me that a fox would come every year with her kids and live inside this tree trunk for a few months. This tree was about 50 feet away from the preceding one. 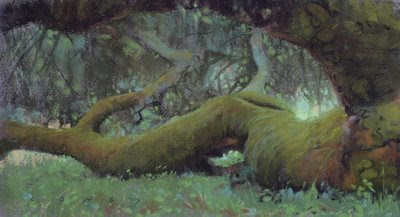 I found these green mossy trunks to be very luminous during the grey light early in the week. I went to work as I spied some sunlight sliding across the hill in the midground, while the mountain behind it was in shadow. Nice to have company out there from time to time. This is a small bridge over a creek in a neighborhood. 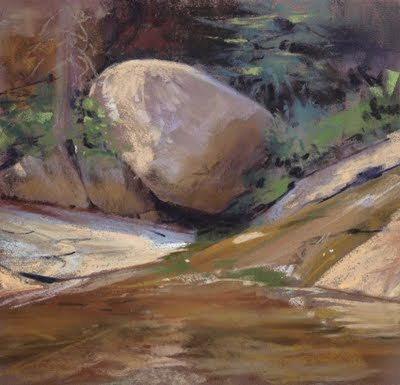 I painted this about 5 years ago, and have checked it every year I come up to paint. 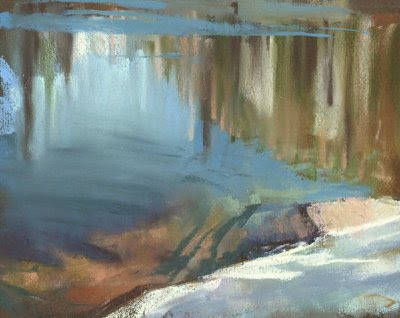 A trio of female ducks came waddling by me, continuing right into my painting, and disappeared around the corner. There are magnificent specimens of Eucalyptus trees all over the Sonoma Valley. Some are bleached grey, others subtly striped with warm and cool bands. Their peeling bark lodges in the crooks of the branches and hangs down like dreadlocks. You got form shadows on the trunk, warm and cool planar color relationships in the shadows, little spots of background color peeking through the dreadlocks... what's not to paint? I thought this one would be easy, but instead had to struggle to get it working, hence it's non-rendered, iconic nature. I had to keep simplifying and flattening my shapes, and then try again. 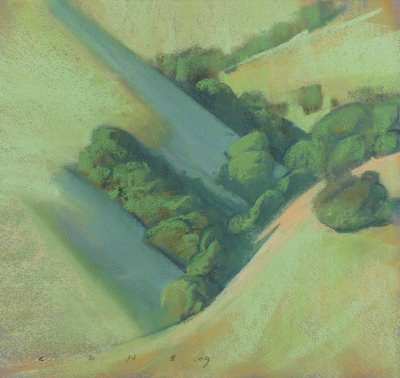 I think I was mainly attracted by the overall shape, plus the color of the shadowed grass, which is about what I ended up with. that many discrete elements in an image, and reminded me of how clumsy my tools are for certain kinds of shapes. Red dot indicates a piece is sold. I had a wonderful experience doing this show. I didn't know what to expect. The whole process has been a great education for me. From evolving a studio methodology for my own art, to trying different framing ideas and styles, to putting together a catalog, the responsibility and challenge of of doing a one person show is a good kick in the pants. Being able to choose from 4 years of work helped me select and edit what went into the show. I used some pieces as studies, that I might have otherwise framed and exhibited, to do more resolved and larger studio pieces. 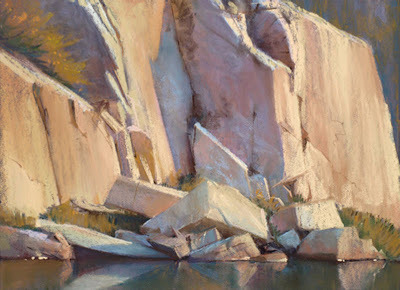 My goal was to have a forum for my work that could be seen as a whole, and allowed the viewer to see the differences in light and color throughout the day. 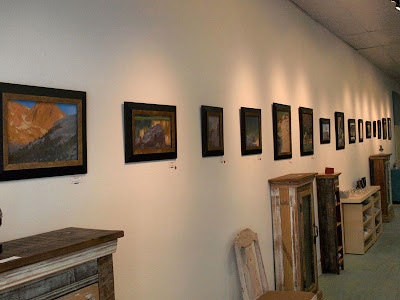 Jennifer Farris and Rab Terry of the Studio Gallery respected my goal, and changed their common practice of allowing customers to take a piece home the day it was purchased, instead keeping the body of work intact for the entire run of the show, for which I am pleased and grateful. 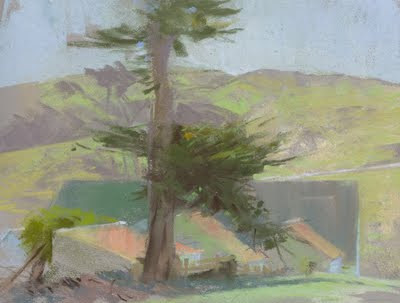 I've always been a bit frustrated by the Plein Air format of putting up all your work in a show, and watching it get decimated in a few hours by buyers, so people that come by later may miss the thread, or range of ideas, one was pursuing and hoping to express. I am not suggesting that the sum is greater than the parts as much as a body of work can have an aesthetic and emotional resonance and range when viewed together that the separate pieces can't. Thanks to everyone who encouraged me to do this, helped me put it together, and who came to the show, purchased my work, and/or offered words of support. This has been a long time in the making, but very rewarding in so many ways. The artists that went up into the mountains were a great catalyst... a mobile community of like-minded souls, that enriched the whole experience. The camaraderie and the opportunity to see the world through other artist's eyes made it that much more stimulating and fun. Patty, my wife, was my partner in selecting and framing all the work, as well as being my on call aesthetic advisor when I was stuck on some visual conundrum. Jennifer Farris and Rab Terry, the owners and operators of the Studio Gallery gave me the opportunity last fall to do this, and have been wonderful to work with. My advice to others is to go find your own mountain and climb it. You can do it! 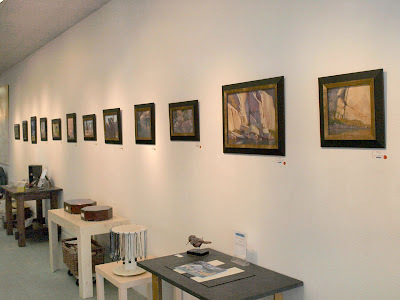 My upcoming show at the Studio Gallery is drawing near, and things are falling into place. My frames and glass are at hand, a catalog of my work is at the printers, and I'm finishing up the last paintings. The catalog will be available for sale on my blog, as well as at the gallery, and I'll post more information about that soon. 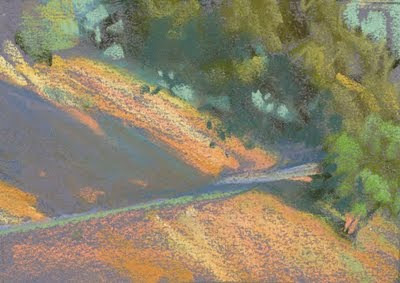 I find I keep returning to a few concepts that compel me to paint. One of them is the notion of seeing inside a shadow. When a shadow contains more than one value, it becomes transparent in my mind, not just a flat shape. 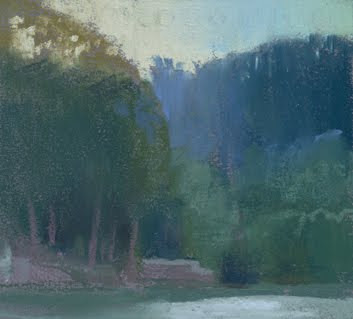 This aspect, as well as the relationship of shaded colors to the illuminated parts of an image seems to be expressing some deep mystery of perception for me. 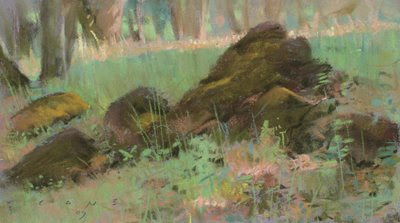 A shadowed part of an image is a volume where one sees qualities that the illuminated parts of an image don't, or cannot, reveal: the color(s) of the ambient, or fill light, the bounce of local colors onto other surfaces — these qualities made apparent by the protective cloak of the shadow can often be imperceptible in direct illumination, yet they may be operating in those areas as well. 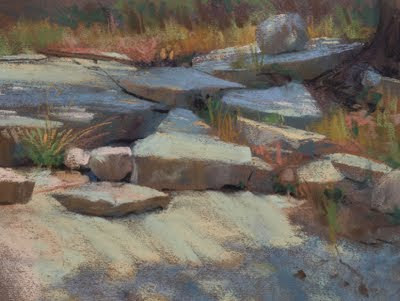 Looking into a shadow is like peeking under the hood at the subtle, underlying components contributing to the overall color and illumination of an image. There's much much more that fascinates me on this topic that I've not articulated. I'm also fascinated by water for a range of reasons, but I'll just mention an elemental one. I remember all the times as a kid, running around on beaches on the California coast, collecting shells and rocks, and putting them in a bucket. They were wet and shiny, and had brilliant hues. The next day, however, when I looked in the bucket, all my 'treasures' were pale and dusted with white. I had to fill the bucket with water to make the rocks look as good as they did at the beach! 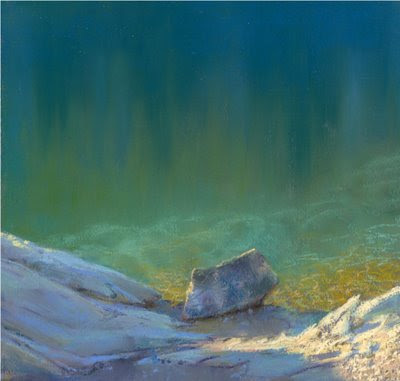 I no longer take the rocks home, and art supplies have replaced the bucket, but sometimes I still feel as excited and intrigued as I once did on the beach when I find scenes of water and rocks to paint. Here's one of the pieces I've been working on for the Studio Gallery show in April. I've flown over Lake Ediza in the winter and it is covered in ice. Funny to think of it in late summer, glowing luminous green in the morning. 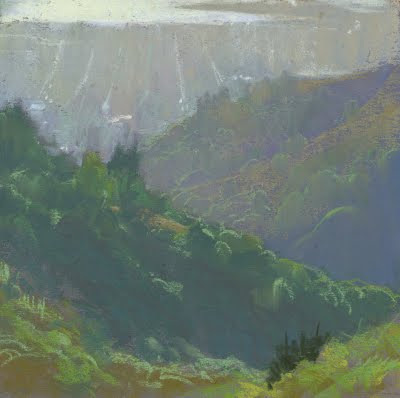 This was the view below my tent, where I would paint in the early part of the day.